"Four legs good. Two legs baaaaaaad." Whatever else you can say about this movie, it belongs on the short list (with Apocalypse Now and some others) of things to watch when you haven't done the reading for tomorrow morning's class. This is a strangely Disneyfied version of George Orwell's classic novella; it's interesting in all kinds of aesthetic and political ways, and cinematically it's more an object of fascination than of entertainment. Which isn't to suggest that it isn't good; it is, though it's slightly bowdlerized Orwell, and probably won't hold the attention of those who aren't familiar with the book. Orwell's story is a fable about anthropomorphized animals, a barely veiled allegory of the Russian Revolution. The livestock at Farmer Jones's place have had quite enough; they've been exploited all their lives, and now they plan the overthrow of Jones, who's a drunk and a reprobate anyway, and probably had it coming. Old Major is the ancient hog who provides the intellectual underpinnings of the revolution; he rallies not just those of his species, but all the horses, chickens, sheep and the rest of the animals, in an effort to create a zoological paradise. From each animal according to its abilities; to each animal according to its needs. Old Major soon dies, and the story concerns the rivalry of his two would-be porcine successors: Snowball, an idealist, and Napoleon, agrarian practitioner of realpolitik. Orwell's story is about the fallibility of revolutions, and of course the political implications of his story couldn't be more obvious: Old Major refers to the other animals as "comrades," and when Jones is deposed, the animals revel in decadence and overabundance. The animation is decidedly dark, but Disney still seems like the launching point; we're in a realistically rendered world, with an aesthetic emphasis on likeness, and sometimes even a Disney-like cuteness. Snowball, for instance, seems a whole lot like Wilbur in Charlotte's Web; he's a cute little pig in the Porky mode, as you can see from the illustration on the cover of the DVD case. (Napoleon, on the other hand, seems almost like a warthog in comparison.) It may seem overly reductive to turn the work of one of the most revered political writers of the last century into a cartoon, but in many ways it's appropriate, because Animal Farm seeks out the tension that comes from telling a political story in the guise of a fairy tale, and Orwell was many things as a writer, but subtle wasn't one of them. Novels written with agendas end up seeming like exactly what they are: not art, but propaganda. And that's evident in the deliberate scarcity of imagination Orwell had in naming his characters: here it's Jones; in 1984, it was Smith. He's interested in types, in two dimensions, and animating his stories seems exactly right. But that also means that Orwell's stories never escape their politics; it's like Ayn Rand, but without the pomposity and verbosity. A good contrast is with The Wizard of Oz�it's endured as a story because we become invested in Dorothy and her friends as characters, as individuals, and not merely because L. Frank Baum's story can be read as a parable of industrialization and the danger of abandoning the gold standard. Animators John Halas and Joy Batchelor have found an appropriate visual style for telling Orwell's tale; where the movie falls down, though, is in its ending, which radically alters the conclusion of the book. We're not quite in the territory of the execrable Demi Moore incarnation of The Scarlet Letter, but kids, if you're writing your term paper based on this movie alone, you may have some explaining to do. Image Transfer Review: A message at the beginning of the feature relates just how much work went in to restoring this film, and it shows; still, some artifacts remain, and there are a fair amount of scratches and discolorations. These can surely be attributed to the ravages of time, and not to any fault of the transfer. Audio Transfer Review: The mono track has its limits, but Gordon Heath's plummy tones as the narrator is balanced well enough with the musical scoring and Maurice Denham's virtuoso turn as the voice of absolutely everybody, on two legs or four. Extras Review: Animation historian Brian Sibley provides a commentary track that traces many of the differences between the source material and the film, and that generally emphasizes the stylistic versus the political elements of the filmmaking. He lets some chunks of time go by without saying anything, but he's obviously well informed about animation and this film's place in its history. The aesthetics are further emphasized with the inclusion of storyboards for seven scenes; they range in length from thirty seconds to eight minutes, and provide a nice look at the process of animation, and display some lovely art work. 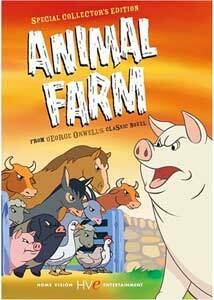 Things are a little more political in Down on Animal Farm (29m:44s), a 1995 documentary on the feature film hosted by Tony Robinson. It traces the early careers of the animators, who started off doing ads for Corn Flakes; it also suggests that the film was funded at least in part by the CIA, and that the film's American producer was the motivating force behind changing Orwell's ending. Robinson also provides a useful Russian Revolution Who's Who, with their analogues down on the farm: Old Major as a stand-in for Marx and Lenin; Napoleon for Stalin; Snowball for Trotsky. Karl Cohen's liner notes offer more fascinating information on the connection between this British production and Central Intelligence, an unholy marriage of convenience that might have made George Orwell grimace and nod. A fascinating palimpsest of a landmark novel, this incarnation of Animal Farm may not be for Orwell purists, and it's certainly not the most subtle piece of work, but it is full of odd fascinations.